Novelist Laila Lalami is one of the most exciting and original voices in contemporary fiction, author of Hope and Other Dangerous Pursuits, which was a finalist for the Oregon Book Award; Secret Son, longlisted for the Orange Prize longlist, and, most recently, The Moor's Account. The Moor's Account is a stunning work of historical fiction: the imagined memoirs of the first black explorer of America, a Moroccan slave whose testimony was left out of the official record. In 1527, the conquistador Pánfilo de Narváez sailed from the port of Sanlúcar de Barrameda with a crew of six hundred men and nearly a hundred horses. His goal was to claim what is now the Gulf Coast of the United States for the Spanish crown and, in the process, become as wealthy and famous as Hernán Cortés. As this dramatic chronicle unfolds through the story of the first black slave in the New World whose name we know -Estebanico- we see that black men played a significant part in New World exploration, and that Native American men and women were not merely silent witnesses to it. Lalami’s novel illuminates the ways in which stories can bring forgotten history to life. The Moor’s Account was a New York Times Notable Book, a Wall Street Journal Best Book of the Year, an NPR Best Book of the Year, a finalist for the Hurston-Wright Legacy Award, and a finalist for the 2015 Pulitzer Prize for Fiction. Writers Joseph Kertes, Laila Lalami, Eimear McBride and Kathleen Winter read from their latest works. Nathan Whitlock hosts. Eimear McBride is a critically acclaimed debut novelist from Ireland. She is presenting her first novel, A Girl Is a Half-Formed Thing, which won the 2013 Goldsmith’s Prize and the 2014 Baileys Women’s Prize for Fiction. The novel explores a young woman’s relationship with her brother, the long shadow cast by his childhood brain tumour and her sexual awakening, all told in a steam-of-consciousness style that drops the reader directly into the protagonist’s mind. Nathan Whitlock is the author of A Week of This: A Novel in Seven Days and is associate editor of Toronto Life magazine. His writing and reviews have appeared in The Globe and Mail, Toronto Star, Maisonneuve, Fashion and elsewhere. Displaying results 1-1 of 1 titles for "Laila Lalami"
Brentwood - Laila Lalami discusses and signs "The Moor's Account"
Diesel, A Bookstore in Brentwood welcomes author Laila Lalami to the store to discuss and sign her new novel, The Moor's Account, on Sunday, September 14th at 3pm. In 1527, conquistador Panfilo de Narvaez sailed from the port of Sanlucar de Barrameda in Spain intent on reclaiming what is now the Gulf Coast of the United States for the Spanish crown. Disaster befell the expedition from the start, and within a year there were but four survivors out of a six-hundred-man crew. Among them were a young explorer named Andres Dorantes de Carranza and his Moroccan slave, Mustafa al-Zamori, who the three Spaniards called Estebanico. The Moor’s Account is the imagined memoirs of Estebanico, this first black explorer of America, an alternative narrative of the famed expedition that saw proud conquistadors become humble servants. Laila Lalami is the author of the short story collection, Hope and Other Dangerous Pursuits which was a finalist for the Oregon Book Award, and the novel Secret Son. Her essays and opinion pieces have appeared in the Los Angeles Times, The Washington Post, The Nation, The Guardian, and The New York Times, and in many anthologies. She is the recipient of a British Council Fellowship and is an associate professor of creative writing at the University of California at Riverside. She lives in Los Angeles. Laila Lalami reads from Secret Son. Laila Lalami is a LibraryThing Author, an author who lists their personal library on LibraryThing. Laila Lalami's book Secret Son was available from LibraryThing Early Reviewers. 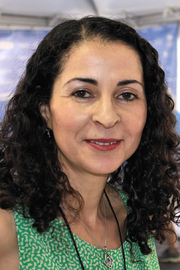 Laila Lalami is currently considered a "single author." If one or more works are by a distinct, homonymous authors, go ahead and split the author. Laila Lalami is composed of 2 names. You can examine and separate out names.